One of our rambles at Dove Stone Reservoir. We run rambles most Saturdays around the north of England in beautiful areas such as the Yorkshire Dales, Peak District and North York Moors National Parks. We also spend a lot of time at rambling around reservoirs including Langsett, Scammonden, Swinsty and Grimwith which are all owned and managed by Yorkshire Water. 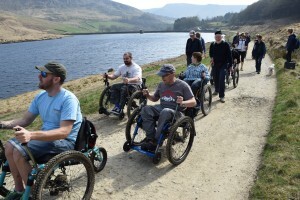 Our rambles are fully inclusive and disabled people’s families and friends are also welcome to join us for the day. Contact us for further details or check our events calendar.